BJP President Venkaiah Naidu on Tuesday re-launched his party’s campaign for the December 1 Assembly election in the NCT of Delhi. The party has christened it the Vijay Abhiyan (victory campaign). Mr Naidu also addressed a rally in Chandni Chowk. The Centre is “critically observing” the ongoing work of Delhi government’s Rs 188 crore Sonia Vihar water project and evaluating it in terms of technological feasibility and its suitability to Indian conditions. Noida girl Nisha Sharma who had hogged headlines in the media for being an anti-dowry icon in May last is slated to tie the knot tomorrow in Modinagar with Ashwani, son of Ramesh Chand Sharma. Even before the Ghaziabad police could crack the Rs six lakh robbery in the State Bank of Patiala branch in Jindal Nagar, Mussori, criminals decamped with Rs 81 lakh from the Model Town branch of the State Bank of India, located in the posh locality of Gandhi Nagar. The Delhi High Court today directed the Delhi Police and other authorities concerned to take steps as per an Action Plan to deport at least 100 illegal Bangladeshi migrants per day and submit a compliance report within three weeks. The Delhi Police Narcotics branch today claimed to have seized 72,000 norphine injections worth Rs 3 crore from a transport company in Mori Gate. The sleuths had also reportedly arrested two persons last month in this connection. The rules regarding registration of birth of a child are under review in Haryana to ensure cent-per-cent accuracy in recording the birth of a newborn. Disclosing this, the Director, Census, Mr Sunil Gulati, said the state government had advised the Education Department to reveal the source of date of birth of a child while getting admission to the school and issuing transfer certificates. 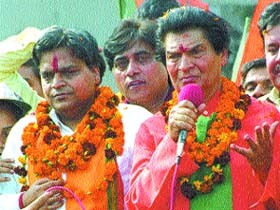 Noted actor Asrani making a point for Ashok Aggarwal, BJP candidate from Model Town for the Assembly election in the Capital. The Municipal Corporation Faridabad may have got a new Deputy Mayor, in the election held yesterday, but this development is unlikely to have any effect on the functioning of the corporation, which is the largest civic body in Haryana. In fact, the corporation is facing an acute financial crunch. Barley farming is showing signs of taking off and capturing lost ground in Haryana, particularly the National Capital Region, thanks to malt producing companies in the private sector giving it the long rope. Farmers growing basmati and muchhal varieties of paddy are at the receiving end during this season as they did not get the remunerative prices for their produce and the per hectare production of these varieties was lesser than of last year. A large number of farmers hailing from six villages held a massive demonstration in front of the office of the Executive Engineer of the irrigation department here yesterday to register their protest against the imposition of penalty (tawaan) on them. The failure of Deputy District Magistrate O.P. 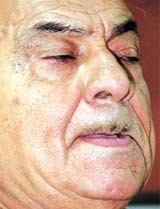 Arya to attend a goodwill meeting at Kotwali Dadri angered some influential persons of the town so much that they simply walked out of the meeting. On the third and concluding day of the Nirankari Samagam, Baba Hardev Singh pointed out that material wealth must go with spiritual enlightenment. “There is nothing wrong about Maya that should make it a curse, it is man’s own attitude that renders it so. 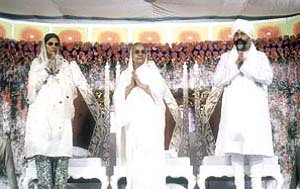 Baba Hardev Singh Ji Maharaj, his holy mother Rajmata Kulwant Kaur and his gracious spouse Pujya Mata Sawinder Ji blessing devotees on the concluding day of the three-day 56th Nirankari Samagam in the Capital on Tuesday. The Third Bhai Chanan Singh Memorial Annual Lecture for 2003-04 was delivered by renowned scholar and connoisseur of fine arts Prof. B N Goswamy. With the help of slides, Prof. Goswamy surveyed the practice of portraiture in Punjab for ages. The Kharkhauda police have arrested one Ram Chander, son of Mr Ram Phal in connection with the murder of a driver Rajesh on October 7. According to a report, all other culprits named in the FIR are absconding and the police have launched a massive hunt for them. A trader Ramesh Batra was killed and one of his associates Prem, alias Lota, sustained serious injuries when a Maruti van in which they were travelling, collided with a canter of Uttar Haryana Bijli Vitran Nigam on G T Road near Badkhalsa village about 13 km from here last night. With the arrest of two persons, the East district police claimed to have solved the murder of two PWD ‘chowkidars’ on September 30 in Mayur Vihar. The police also claimed to have solved 11 more cases of thefts of electrical fixtures on the roads in Delhi. 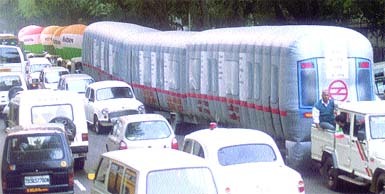 Once Ghaziabad was known as an important industrial town of UP. But now many industrial units here are on the brink of closure. According to entrepreneurs, hundreds of small industrial units of Ghaziabad have been ruined. This one sure is a relief. We finally have someone accepting that they won a crown… a title on the basis of looks. 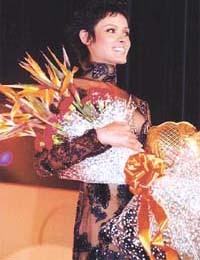 The metropolitan top model India contest 2003 had the lass from Kolkata Sharan Mishra walk talk as a winner, because she has the face, the body and the attitude. Mishra who spared us the Mother Teresa is my idol… answer will now represent India at the coveted International Metropolitan Top Models Contest that is slated to be held at South Africa this December. 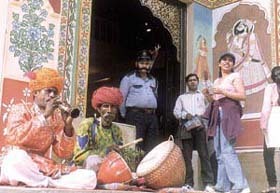 Sharan Mishra holding a bouquet. They may just about be able to keep the cold out, but stoles in colourful hues, embroidered or plain or even studded with crystals are accessories to enhance the winter apparel. She may well have stepped out from the pages of a fairy tale. A queen who is by some divine benediction, eternally beautiful. 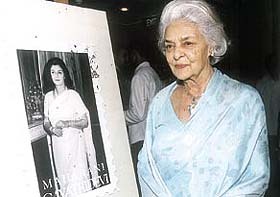 Synonymous with beauty and poise Maharani Gayatri Devi is also an icon of romantic yore. Diamond Trading Company has dedicated a range of diamond jewellery to Rajmata Gayatri Devi, the timeless icon. It is not just winter, that is the season… with the number of weddings scheduled for the months ahead… we might as call it the wedding season. And with the wedding season on designers, jewellers, marriage planners and even cosmetologists have all turned up with their prescriptions to make it a ‘wedding to remember’. Kaya Skin clinic has announced skin care solutions and free online consultation. For the brides and the grooms to look “radiant” and with “oh so nice skin” there are a special packages. 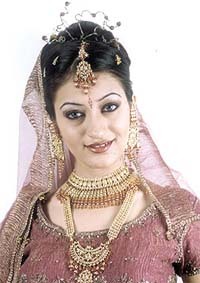 Precious jewellery from Dwarka's wedding collection. To exhibit the masterstrokes of painters, the next best place after the walls is fast becoming the torsos. After hand painted saris and clothes imprinted with the paintings of the likes Raja Ravi Verma, People for Animals too has unveiled a limited edition pashminas inspired by works of contemporary master artists and top Indian designers. A fashion show, to celebrate the opening of a showroom, was attracted the crowds at City Centre Mall. Denis Parkar brought in models Himanshu Malik, Rajat Raina, Sachin Khurana, Anjala Singh and a few others to showcase their wear. The state Health Department has launched an ambitious programme for AIDS awareness and control in the state by engaging private hospitals and practitioners in every district through the District Red Cross Societies. Defending champion Anjali Chopra shot a two-over par 74 to take a narrow lead in the 72-hole open stroke play 36th Ladies Northern India Golf Championship at the Delhi Golf Club course on Tuesday. Indian football may not be making great strides, but star striker Baichung Butia is doing fine, thank you, and is sitting pretty after netting yet another lucrative sponsorship deal. An exciting knock of 90, studded with nine fours, by Saurabh Srivastava, 67 by Tarachand, and supported by the deadly bowling of Deepak Kanojia (4 for 32) enabled K N Colts beat Gemini by 14 runs to enter the quarter-final of the third C L Gupta Memorial Cricket Tournament for the Prem Lata Trophy at the Mohan Meakins ground. Saurabh was declared the man of the match. An unbeaten knock of 73, studded with 11 boundaries, and a devastating 3 for 23 bowling spell by Subodh Badola helped Pan Business List beat Canara Bank by six wickets and entered the semi-final of the Suntan Cup Cricket Tournament at the Vinay Marg ground. 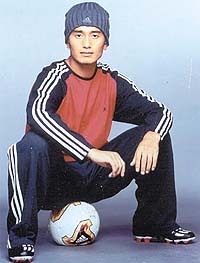 Ravi Uniyal was named the man of the match. Strokefilled half centuries by Chirag Paul (69 n o, 8x4, 85b) and Raghav Pandey (65, 8x4, 57b), and deadly off-break bowling by Honey Garg (4 for 14) enabled Hans Raj College beat IGIPESS College by 15 runs in the Inter-College Cricket Tournament at the Khalsa College ground. Hosts Salwan School had mixed luck in the seventh Salwan Inter-School Volleyball Tournament, which was inaugurated by school principal Vandana Puri in the presence of Salwan boys principal Mrs A Sharma when their girls won and boys lost. The Delhi Badminton Association will hold a ‘Talent Search Contest’ in association with Indian Oil to identify promising players and then give them the necessary facilities to enable them realise their true potential.